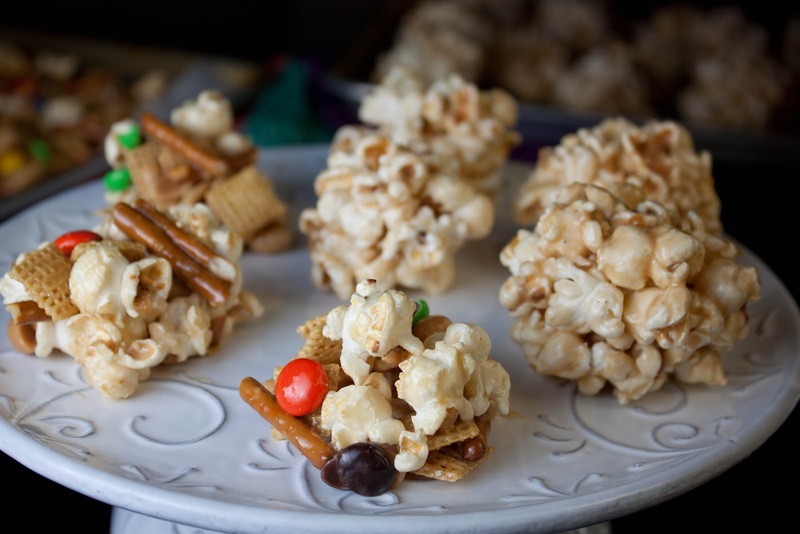 The result is one gooey pumpkin flavor popcorn ball and one faint-rum undertone sticky snack mix. Either would be great for your Halloween party, just serve them with napkins. The moral of this story is that with a few fat and happy modifications, you can ultimately get around your weakness. Or the moral might be that booze doesn't actually go with everything, but I'm not ready to admit that yet. Pop the corn: heat the oil over medium-high heat with 3 kernels of corn in a covered pan. When the first kernel pops, add in the remaining kernels, shake and cover. When the kernels begin to pop, prop open the cover to allow steam to escape, shake well. Remove from heat when there is 3-4 seconds between pops. Have popcorn in a large bowl ready to mix with the marshmallow mixture as well a sheet pan either buttered or covered with parchment paper. Make the boozy pumpkin marshmallow goo: Place the butter, brown sugar and marshmallows in a pan over low heat. Melt to combine, stirring often with a heat proof rubber spatula. Add in the Pumpkin Liquor and the cinnamon, stir well. Carefully pour the mixture over the popcorn and fold until the popcorn is coated. Butter your hands and begin to form balls. If the mixture is sticking to your hands, run them under cold water, shake off the water and them form the balls and set them on the sheet pan. Let the balls dry for a while; eat within a day or two. 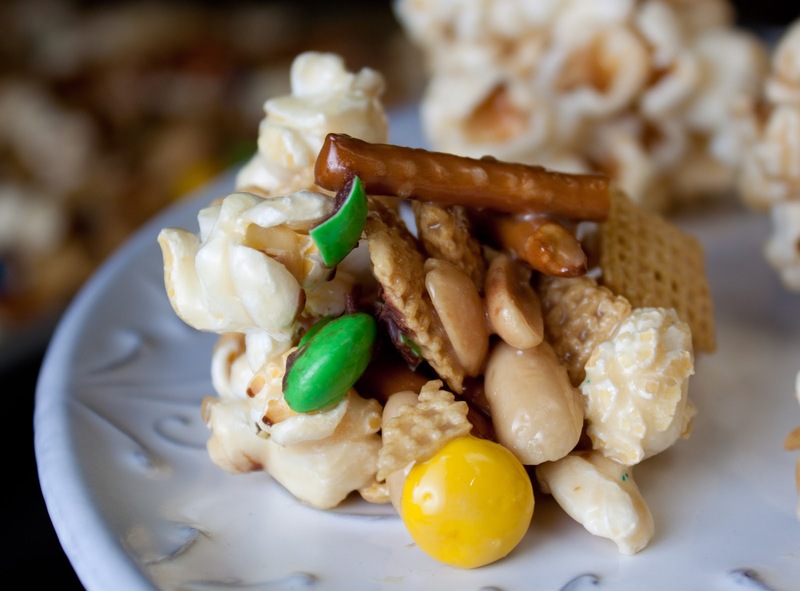 In a large bowl, toss together the Chex, pretzels, M&M's, peanuts and popcorn. Make the rum marshmallow goo: Place the butter, brown sugar and marshmallows in a pan over low heat. Melt to combine, stirring often with a heat proof rubber spatula. Remove from heat. Slowly stir in the rum, stir well. 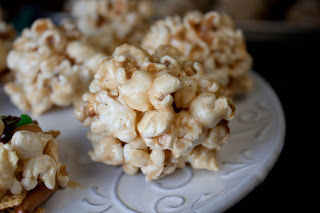 Carefully pour the goo over the popcorn mixture and fold until the everything is coated. Butter your hands and begin to form balls. If the mixture is sticking to your hands, run them under cold water, shake off the water and them form the balls and set them on the sheet pan. Here is my disclaimer on these- forming these into balls proved rather tricky. I found it best to actually for a ball is to spoon a pile into the parchment paper and try to guide it together. Think of this as a gooey snack mix over a formed ball. Best eaten within a day or two.